Arts & Crafts brass hall mirror with raised stylised leaves and flowers to the border and studded corners. This measures 61cms high and 30cms wide and the mirror plate is 30cms x 17cms. Pretty but not great quality. Offered in good original condition. Lovely pair of Dutch scene prints by the Belgium artist Henri Cassiers (1858 0 1944). These are mounted in oak frames and carry the Liberty ivorine label to the reverse. Each frame measures 55.5cms x 46cms and the size of the prints is 42cms x 32cms. Offered in good original condition although the frames have some dings. 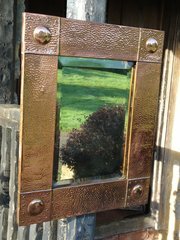 Arts & Crafts copper mirror with raised cabochons to each corner - a design retailed by Liberty, The frame measures 53cms x 42cms and the mirror plate is 34cms x 24cms. Offered in good original condition however there is a loss of silvering to the top right hand corner of the bevelled edged mirror plate. Unusual Art Deco pewter over mantle with its original bevelled edged mirror plate. It stands on two stepped bases. There are scenes of a peacock and a crane supposedly taken from Aesop's fables: The peacock and the crane. The mirror stands 36cms high with a width at the base of 77cms and a width at the top of 72cms. The depth at the base is 6cms. Offered in good original condition with some chips to edges of mirror plate. This has been cleaned as much as possible but some marks remain on the steps. Arts & Crafts copper mirror with fleur de lys motif to top and raised border around mirror plate. This measures 67cms wide x 50 cms in height with the mirror plate being 41cms x 24cms. The copper has a slightly warm rose colour and has been cleaned but some dark spots were hard to reach. Offered in good condition with replaced mirror plate. large Arts & Crafts copper mirror or over mantle with roses. This has its original bevelled edged mirror plate with minor marks. Offered in good condition with a metal back and is currently hung as landscape. Width 86cms. Height 60cms. The mirror plate measures 74cms x 50cms. Large Arts & Crafts brass mirror or over mantle with a medlar and leaf pattern to four sides. This fruit was used in many designs my Newlyn. A good heavy mirror with its original bevelled edged mirror plate. This mirror was originally silver plated and tiny remains can still be seen as edge of a few of the leaves nut ds not detract from its beauty. Offered in good condition with a replacement back. It measures 85cms x 60cms. 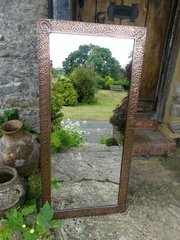 Large Arts & Crafts Copper mirror that would make a lovely over mantle. Slightly rustic in execution with horse shoes to each corner. The mirror plate and backing have been replaced. There are tiny marks to each side with indicate that perhaps it was part of cheval mirror at some point but these marks are difficult to see but are mentioned for total accuracy. Fixing will be added once the purchaser decides whether to hand it as landscape or portrait. The frame measures 120cms x 58cms. 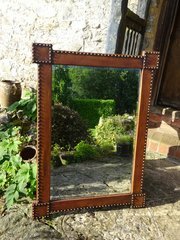 Unusual Arts & Crafts leather mirror with a studded edge. It retails its original bevelled edged mirror plate with has slight frosting. Offered in good condition although there is minor wear to leather as to be expected. This is currently hung as portrait but has been hung as landscape in the past and would make a stunning over mantle The frame measures 95cms x 69cms and the mirror plate 75cms x 49cms. Large Arts & Crafts Scottish school over mantle with floral decoration. It has an oval bevelled edged mirror plate to centre and wooden back. Offered in excellent condition with the frame measuring 83cms wide and 56cms high. 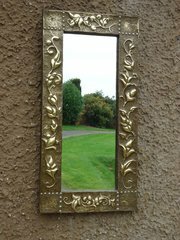 Good quality Arts & Crafts brass mirror offered in excellent condition with its original bevelled edged glass plate. This has a metal back is currently hung as landscape measuring 57cms wide and 34cms high. The mirror plate is 41cms x 19cms.